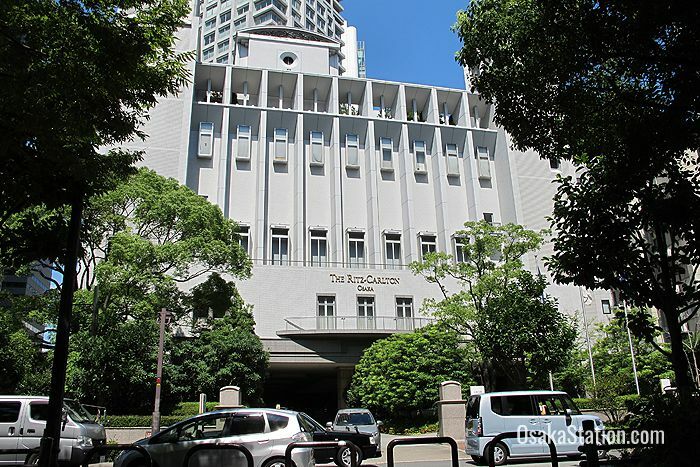 On arriving at the Ritz-Carlton Osaka you will be greeted by smiling doormen in top hats and gracefully ushered into elegant interiors of dark wood paneling, and twinkling chandeliers. The artworks, antique furnishings, and classical musicians playing in the lobby will quickly make you feel like you have somehow slipped into another time and place: 18th century Europe perhaps, rather than ultra-modern Umeda. Certainly, in Osaka this is the closest you can get to staying in a palace. The jaw-droppingly splendid décor is matched by courteous and attentive service, high class dining facilities, a superb range of amenities, and extremely spacious rooms. 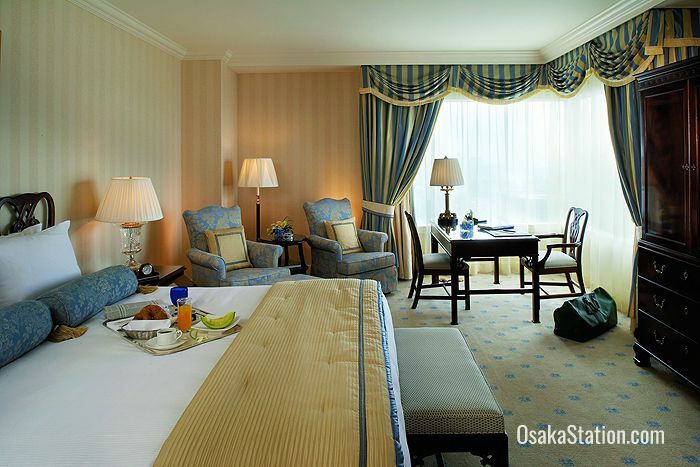 Simply put, the Ritz-Carlton Osaka provides the most luxurious accommodation in Osaka, but is also the city’s most expensive hotel. 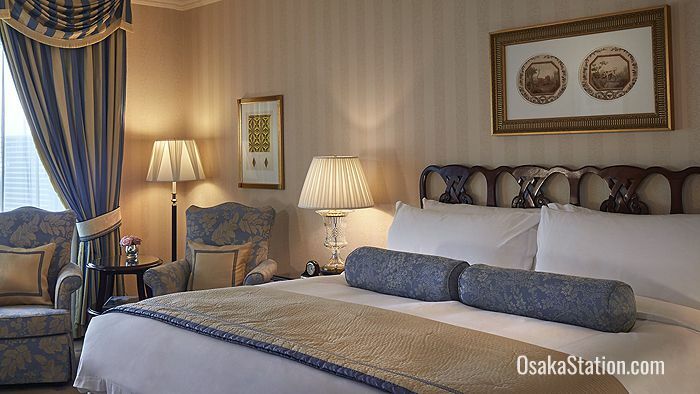 The Ritz-Carlton Osaka has 292 guest rooms, with varying degrees of sumptuous comfort, ranging from the least expensive Deluxe and Superior rooms to the ever more lavish suites. Most rooms feature a choice between a King bed or Twin beds, and all beds come with soft Egyptian cotton sheets, goose down pillows and non-allergenic down comforters. Bathrooms have Italian marble bath tubs, with separate shower facilities. The toilet with its bidet are also separate from the bathing facilities. All rooms are fitted with a stereo DVD audio player, coffee making facilities, a fully stocked fridge, plug-ins for computers and other devices, and free high-speed internet access. 24 hour room service is available, along with complimentary newspapers, and all rooms boast scenic views. The hotel’s two Japanese Suites differ from other rooms in the hotel in being fitted out with tatami matting, shoji paper screens, decorative Japanese artworks, and futon mattresses rather than beds. They also have special bath tubs made from Mikage granite rather than Italian marble. The most extravagant suites on offer are the Ritz-Carlton Suites on the 36th and 37th floors. These include two living rooms, a separate dining room that seats eight, a marble jacuzzi bathtub with its own TV, and a grand piano. 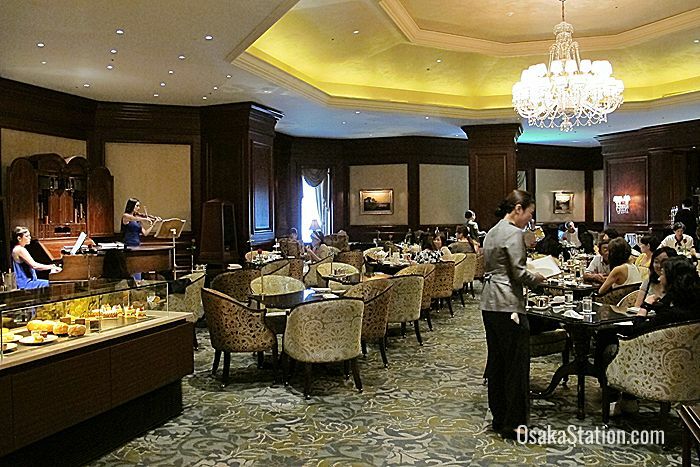 The Ritz-Carlton Osaka has four restaurants, a bar and a lounge. Splendido is a casual restaurant serving classic Italian fare: Napolitan pizza, pasta, risotto, soups, cheeses and desserts, and has a fine selection of Italian wines. All seats are non-smoking. Xiang Tao is a Chinese restaurant specializing in Cantonese cuisine such as Hong Kong style Dim Sum, but also serving other regional standards such as Peking Duck, or Szechuan style noodle soup. A range of Chinese teas and rice wines are available and all seats are non-smoking, except for those in private rooms. La Baie is a more formal French restaurant with a fixed dress code: casual smart at lunch time, and “sophisticated elegant” for dinner. As a rule of thumb this means, no shorts, t-shirts, or sandals, and a shirt and jacket for men is recommended in the evening. Courses include a variety of carefully crafted dainty meat and shell-fish dishes and judging from the pigeon, beef, duck and foie gras on the a la carte menu, La Baie is a paradise for the sophisticated carnivore. Sommeliers can assist with choosing appropriate wines for each course. Hanagatami serves five varieties of Japanese cuisine: sushi, teppanyaki iron griddle cooking, deep fried tempura, sumibiyaki style char-grilled vegetables, fish, and meats; and high grade kaiseki course meals. The drinks menu also features a variety of European wines, and Japanese sake rice wine and shochu spirits. Except for the private rooms, all seats are non-smoking and overlook a traditional Japanese garden. The Bar stocks 150 malt whiskies, a fine selection of cigars and is enlivened by live musical performances. The Lobby Lounge serves light meals, cakes and desserts, and has a broad selection of tea and coffee varieties, along with stronger beverages. Classical musicians entertain the guests as they nibble their pastries in a Georgian style sitting room. The Ritz-Carlton Osaka has a fully equipped fitness gym, an indoor swimming pool, a spa with both a dry sauna and steam room plus indoor and outdoor Jacuzzis. The spa offers a variety of massage and reflexology style treatments. Complimentary tours are available for guests of both the hotel’s European art collection, and of the sights and attractions of Nakanoshima Park which is just a 15 minute walk from the hotel. There are also free origami lessons every Tuesday in the lobby at 16.00. There is a Ritz-Carlton Boutique and a Gourmet Shop on the hotel’s first floor, selling unique souvenirs and cakes, breads and conserves, all stamped with the Ritz-Carlton brand of excellence. 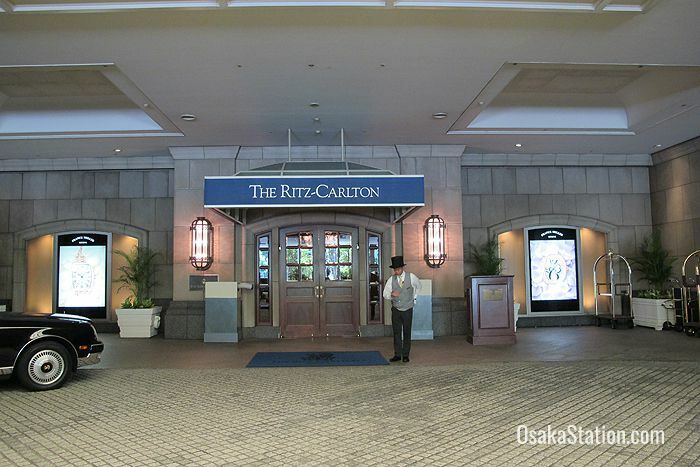 The Ritz-Carlton Osaka is a 9 minute walk south-west of Osaka Station. 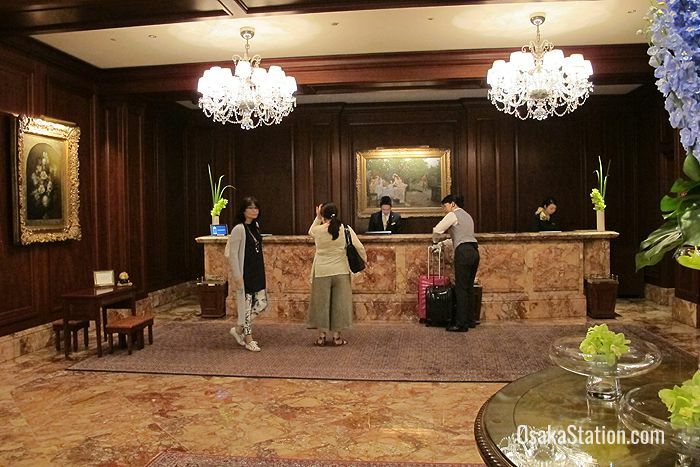 It is easiest to access the hotel via Osaka Station’s Sakurabashi Gate. Signs along the way will point you in the right direction.